Grief, as defined by Dictionary.com means, “A keen mental suffering or distress over affliction or loss; sharp sorrow; painful regret.” From both my personal experience in suffering loss and from working with grieving clients, I have come to realize that grief is distressful both as an intra and an interpersonal experience. For many, the symptoms of grief can be so despairing and isolating, it can feel like the body has forgotten how to breathe. Motivation is depleted and societal support can be, overall, lacking. While grief is complicated and can include many types of loss, I am speaking specifically about the loss of a loved one. Unless you have personally walked through the trenches of grief, most people struggle with providing empathy to those suffering. And, for those suffering, it is likely their world feels foreign and overwhelming. While some individuals do step forward to support, many withdraw because they are uncertain as to what to say or how to help. For many individuals with healthy circles, support may last for several months, but afterwards, the myth that grief is short-lived causes the support to slip away. While individuals can and do recover from grief, it is an active process that involves courage, processing and time to heal. 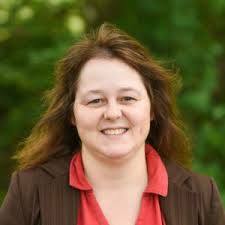 Yes, it is possible to feel healthy again although grief forever changes most anyone who has walked its path. When an individual recovers from the loss of a loved one, he or she has reached, what is called, Integrative grief. With the help of continued support and for some, therapy, individuals learn how to strengthen their coping skills in order to grow their emotional tolerance for the sorrow that grief entails. These brave individuals actually make room for the grief in their life as opposed to avoiding it. With work engaging self-love and self-care grief can become manageable, enabling a healthier self to surface. Individuals who have reached integrative grief have faced their darkness by opening up to the sorrow and/or regret and by processing this trauma. It is emotionally painful and physically depleting but, it is possible! 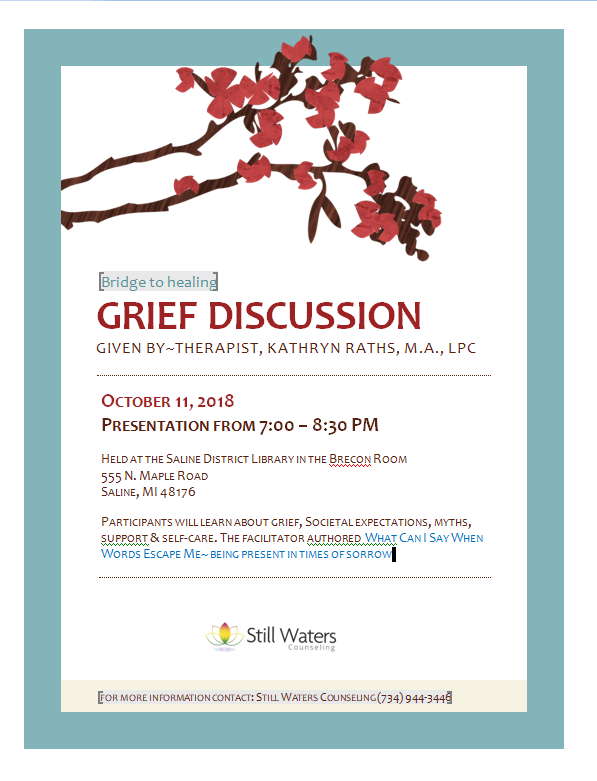 On October 11, 2018, from 7:00 PM – 8:30 PM, I will be leading a FREE discussion on grief, which is open to the public and held at the Saline District Library in the Brecon room. During this discussion, I will expand on societal expectations and grief myths, coping tools, healthy support and community resources to help during this difficult time. I have learned that grief is not a comfortable topic for most to discuss and therefore, I believe, it is imperative to get more conversations like this one going in our communities. The more we can talk about it, the more we can educate ourselves and support our loved ones who are suffering great loss. Please join me for this discussion and bring anyone whom you believe may benefit from the discussion along with any questions you may want to address. I look forward to meeting you and having a heartfelt interactive dialogue.